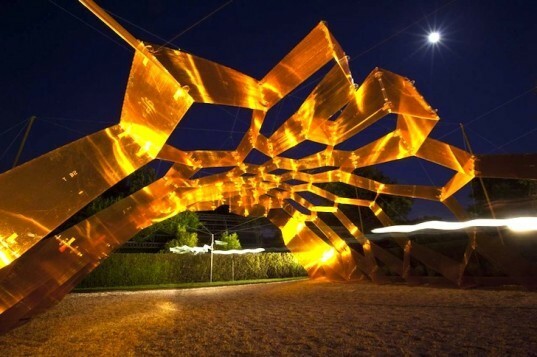 Gonçalo Castro Henriques of X-REF won an international landscape design competition to realize Honey Scape - an inspiring temporary pavilion for Ponte-Lima, Portugal that looks like a gigantic golden honeycomb. Ensuring a harmonious relationship between the installation and surrounding green space was an important aspect of the brief. Also, just as many bees are required to make a honeycomb, several self-organizing and cooperative hands were required for this ahem sweet project to reach fruition. The components were digitally fabricated and constructed on site using metal connectors and a cable system. 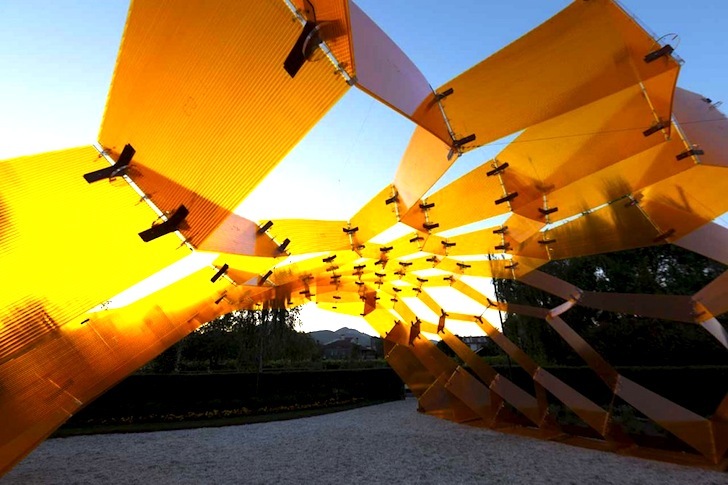 The resulting low-tech, 280 square meter pavilion commissioned by the municipality of Ponte de Lima and completed earlier this year heralds a new type of bio-tech art. Its main purpose, in addition to introducing a new aesthetic into the public realm, is to establish ultimate synergy between people and the built and natural environment. The "combs" are locked together using a cable system and metal connections. The project is a study in biotech art, which is designed to create the ultimate symbiosis between nature and the built environment, as well as with people.